It’s a new year, but same old drama in the sleepy Yorkshire village of Emmerdale. Find out what’s happening in the Dales this coming week. 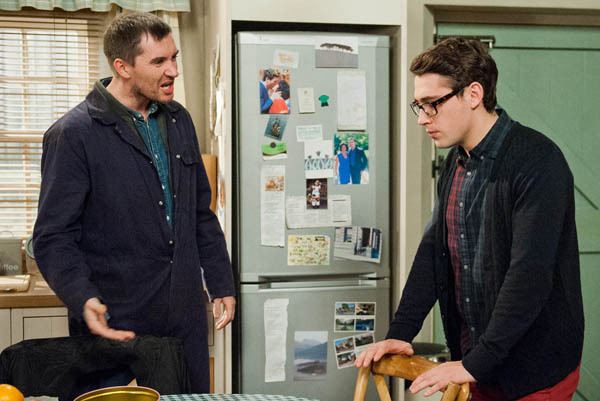 The end for Cain Dingle? Grumpy Granddad Cain, has been incredibly grumpy of late and this week we find out why. Cain has yet another headache and when Debbie’s car breaks down, he takes it out and blames it on Dan even though he knows he must’ve done it. Moira is concerned about his behaviour, confiding in Charity who is just as clueless, although more suspicious and she heads to the garage later that evening where she finds Cain getting up off the floor after collapsing. Like a dog with a bone, Charity continues to push Cain for information as the week pans out and she panics when he explains his symptoms and she insists on taking him to A&E. Cain is terrified when he learns he’s got an aneurysm that will require an operation right away. Unable to cope with the news, he lies to Charity that it’s nothing serious. Meanwhile, Moira confides in Chas that she’s worried something is going on between Charity and Cain; Debbie later unknowingly adds fuel to that fire. Charity is devastated when Cain cracks and tells her that he could die any minute. She wants to tell Moira, but Cain threatens her with eviction if she does. It all comes to a head when Cain collapses and is found floating unconscious in the icy river by Kirin and Vanessa who call an ambulance. Later at the hospital everyone fears the worst. With her suspicions raised and revenge on her mind, Katie manages to sneak a look at Robert’s mobile phone as is convinced he’s cheating on Chrissie. She threatens Robert that she’ll tell Chrissie all about his affair with ‘A’, leaving him unnerved. Later, Katie tells Chas about her discover and she speculates it could be Alicia. Upon hearing their conversation, Aaron is left panicked, but doesn’t like what Robert tells him when he fills him in on the situation; the pair can no longer be together. Katie is more and more certain that Alicia is the one that Robert is having an affair with and when Robert learns of this he plays up to it, flirting with Alicia in the Woolpack. It seems that Katie may have played right into his hands and humiliation awaits her. Elated at finding his long-lost mother, Emma, Finn is now on a mission to tell the rest of his family. He soon realises he might be the only one that’s pleased to see her when his brothers and father are furious and dumbfounded he’d do such a thing. Pete even goes so far as to give Finn an ultimatum and tries to get Victoria to persuade Finn to let sleeping dogs lie. Will a heart-to-heart with Debbie about her reconciliation with Sarah manage to change Pete’s view on things? Adam has a plan of action to win back Victoria. Will it work? Leyla is shocked to see her house is up for sale and she and Vanessa plot to sabotage the sale. Laurel they have a dry January, but can she stick to it? Chrissie is pleased Lachlan has joined the football team and he seems to have found a new hero in David.